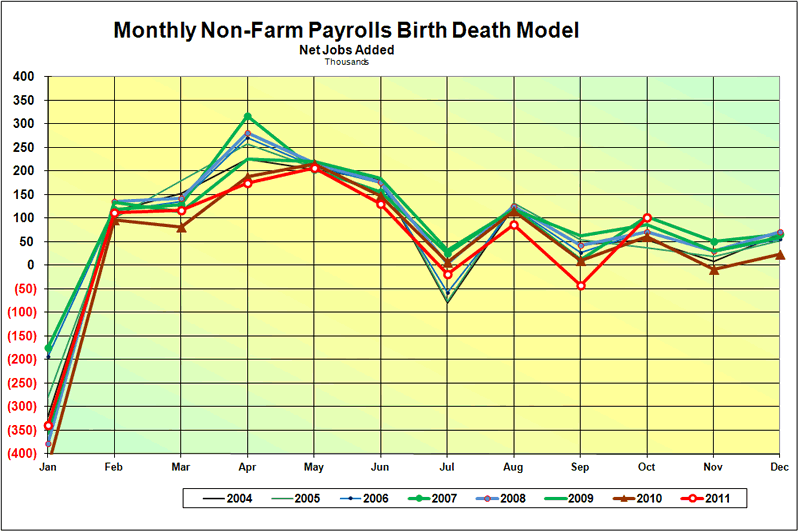 The Birth-Death Model was out of normal to the high side enough to raise a comment. This is shown in the first slide. Lately the BLS statisticians had not resorted to this and had actually been running at estimates a little more to what one might expect in a business slump. 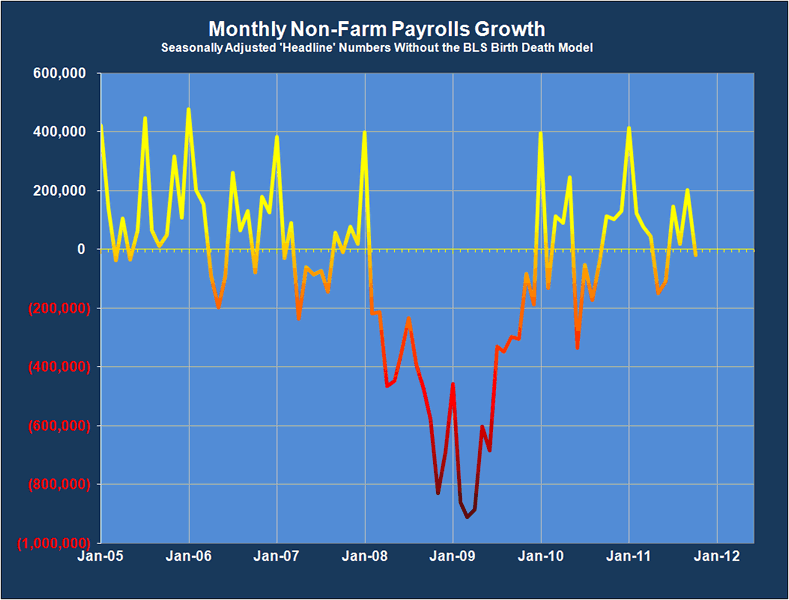 The headline number without the Birth Death model, deseasonalized, showed negative growth. 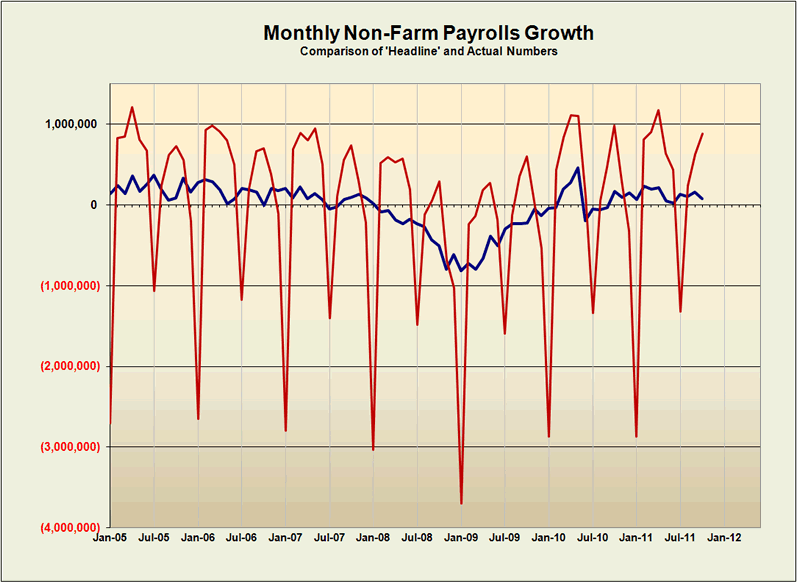 So the truth is probably that jobs growth was flat to negative. But even that nugget of truth is liable to be lost in future revisions. I wonder if the desire to show growth will skew the statistics even further as we go forward. 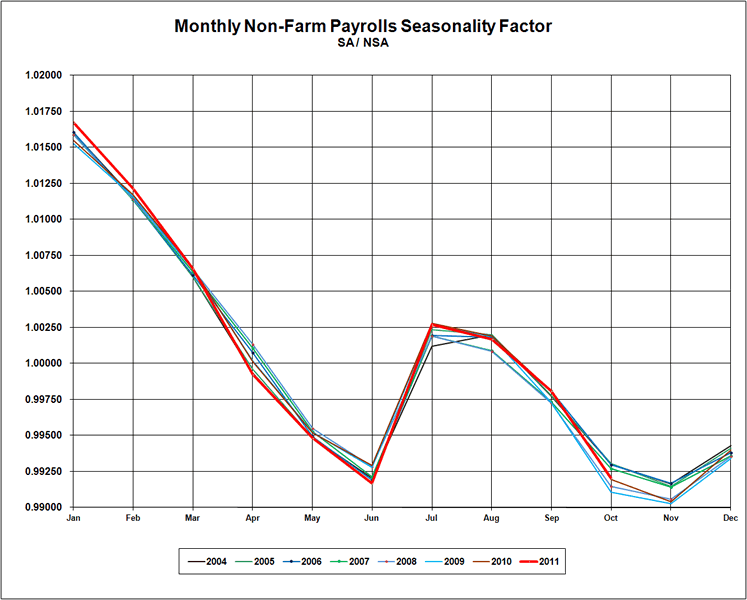 Typical games are to play with the chain deflator in GDP to make it look better, and to play with seasonality, birth-death model, and rolling revisions in the payrolls numbers. And of course the tinkering with CPI is apparent to anyone not carrying an agenda who has looked into the mechanics of the changes in the past ten years. But I suppose since Obama is speaking this morning at the G20, and telling Europe how to solve its banking and debt problems as the US has done, a passable grade on jobs growth was de rigueur pour le charlatan. Next up, blame the slump on Europe after allowing your hedge funds, banks, and talking heads of the financial demimonde to drag them down, and then implement QE3 as a rescue plan. Anything, rather than admit to the corruption in the system and then have to engage in meaningful reform. This is the nature of a credibility trap in the aftermath of the deep capture of politicians and their apparatus by the monied interests in a crony kleptocracy, teetering on the edge of general discovery. If Obama is Hoover, which may be a somewhat flattering comparison to both, then where on the political horizon is Roosevelt? So far all that is offered to the voters is a choice amongst a freak show of corporate goons, imperious ideologues, and mini-Mussoliniani.